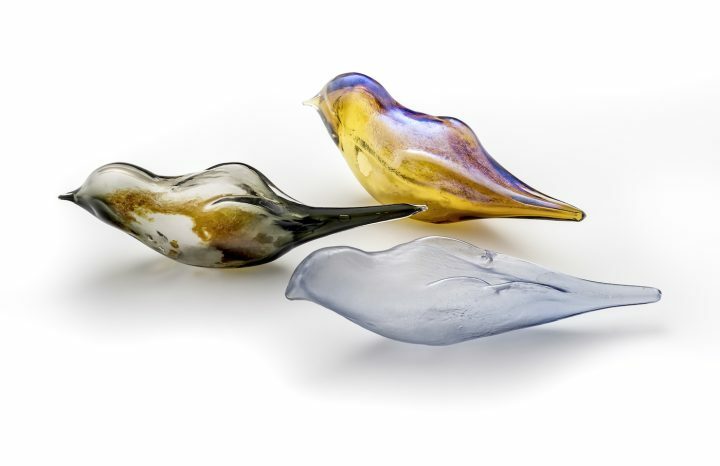 Intricate glass sparrows serve as an apt metaphor for millions of refugees who can’t go home. 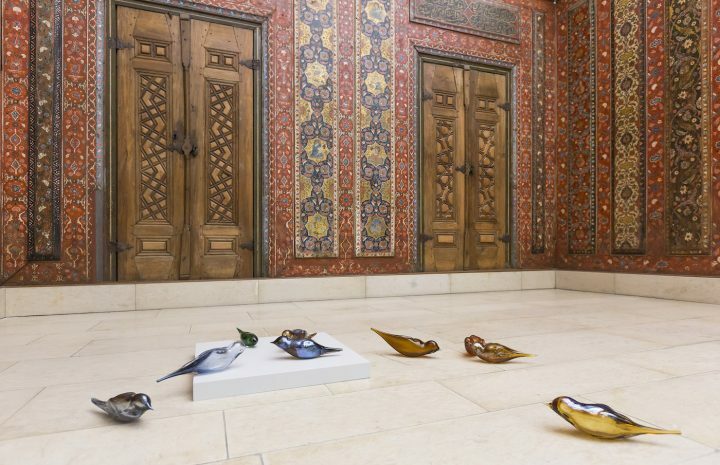 In January, a flock of delicate glass swallows settled in the Aleppo Room at the Pergamon Museum in Berlin, Germany. Since then, they have sat on the floor, shimmering and seemingly poised for takeoff, as though preparing to fly home. 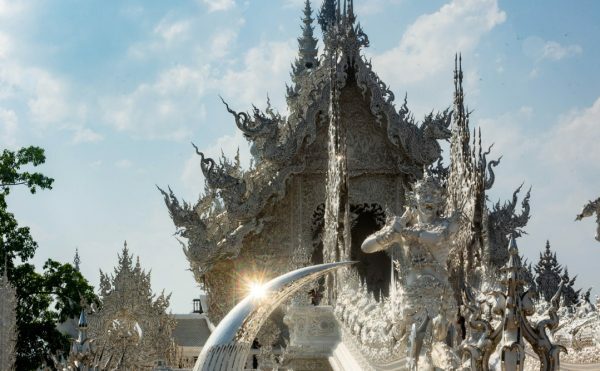 Light reflects off and refracts through the birds, making them seem to move; their earthy hues echo colorful details on the wooden doors and walls, which form a courtyard-like cage. 27 birds make up Perched, an exhibition created by the Turkish glass artist Felekşan Onar. Though beautiful, their small forms are static, perhaps trapped in the knowledge that home is out of reach. In the Aleppo Room — which takes its name from the once-thriving Syrian city that civil war has reduced to rubble — they serve as a metaphor for the millions of refugees who can’t return to Syria. Each bird looks delicate, even insubstantial. You want nothing more than to pick them up, to stroke them and protect them — yet at the same time they’re tough and strong. Onar has harnessed the contradictory nature of glass: the birds are whole, yet prone to shattering into tiny pieces of nothing. The walls around them, elegantly hand-painted in the 17th century, come from a Syrian residence of an Armenian merchant from the Ottoman period; they’re reminiscent of a time when the city was prosperous, its residents free to come and go. Just as war can change a person’s life in an instant, the actual blowing of the glass takes only a moment. But the process takes a long time to get right. After a successful career in industrial textile design, Onar took a week of introductory lessons in glass design. Then she ordered a kiln, installed it in her garage, and within a few months, was working solo. She has taken classes at the Glass Furnace in Istanbul, but mostly she learned through trial and error. Five years teaching herself showed her that glass behaves in unpredictable ways. Onar kept meticulous records of each step of her process. Producing glass art, to use her own words, is “almost like cooking — you cook something, and have to add more or less of something.” She starts with a quick sketch before she begins, which allows her to compare the final product to her initial vision. Manipulating and shaping glass requires high heat and intense physical labor. 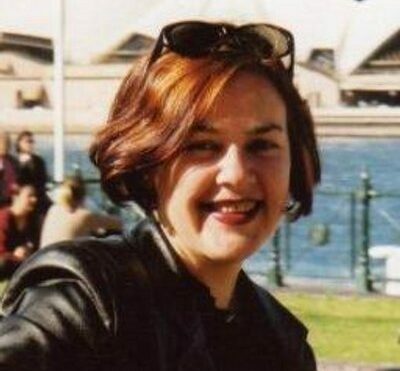 In Istanbul, she has long worked with her own team, but for Perched, she worked in Germany with Berlin Glas. Once Onar had a design she was happy with, she made a model in clay, then created plaster blowing molds from the original clay model. Each mold can only be used a few times. This means that although each bird draws on the same design, they vary in color, texture, and translucency, giving each a tangible individuality. The idea for Perched was also a long time in the making. Onar grew up in Söke, in the Aydın Province of Turkey. Like many towns situated on the Aegean, Söke was home to a mix of Turkish-born Greeks called Rum, who lived alongside Turks until an official relocation agreement, based on religious identity, was signed in 1923. More than a million people were displaced. Onar’s childhood housekeeper, a woman called Nazmiye, was born in Crete and was forced to move to Turkey as part of the exchange. The artist remembers hearing stories about the island in Greek-accented Turkish. A recent reading of Louis de Bernieres’ novel Birds Without Wings brought memories of Nazmiye back to Onar, in vivid detail. Onar now considers Istanbul her spiritual and physical home, the place where she feels most able to express her creativity — but the city is undergoing enormous change. In the last few years, signs in Arabic have covered over the shabby chic European-style buildings of Beyoğlu, where her studio is located. Onar said that the “old buildings tell me that what I do today isn’t important, life continues and everything will go on, whether I’m part of it or not. These places make me think about a larger range of history.” Today, history is happening in Istanbul. Of the millions of displaced Syrians who have fled their war-torn homeland for Turkey, more than half a million have found a precarious perch in the metropolis, trying to find a new place to nest. The events of the present mirror the mass migration that shaped Onar’s past. Then as now, seeking safety, limited by language, lacking money and connections, people on the move have become, in Onar’s words, “birds, not without wings, but perched, grounded.” Perched is a visceral expression of the fact that in spite of differences of religion, culture, and individual histories, what we all want most is to be in the place we call home. Perched continues in the Aleppo Room of the Pergamon Museum (Bodestraße 1-3, Mitte, Berlin) until April 9.